Bookshelves towering floor to ceiling filled with weighty tomes, or one book-sized device holding hundreds of “books” in electronic form: which one of these options for the voracious reader creates the least damaging environmental footprint? There is no easy answer to the question, dependent as it is on personal environmental values and a reader’s reading habits. eReaders tend to be popular not only amongst voracious readers but also amongst occasional readers, who might previously have only owned a handful of books, complicating the question further. Regardless, more can be done to improve the environmental performance of both eReaders and paper publications. The environmental consequences of pulp and paper manufacturing are well documented, even though the worst excesses are now corrected. But at least once the paper is made and the book published, there are no significant further negative impacts and the carbon is captured. eReaders have a higher environmental cost per unit – but unlike books, you can get by with only one. There are higher environmental costs involved in manufacturing an eReader unit compared to a unit of paper, and there are on-going operational effects. However, one eReader can hold any number of eBooks, newspapers and magazines – which means that eReader users purchase fewer printed publications. Trying to environmentally promote or denigrate – depending on your point of view – one form of reading over another is inevitably controversial, and perhaps futile. It is not just about numbers, such as tonnes of CO₂, raw materials and waste, but also about human behaviour and interpretation of the impacts. For example, is the logging of (mostly plantation) trees of greater environmental significance than the extraction of limited resources of rare earth metals? Is it more important to consider the greenhouse effect of CO₂ emissions rather than the health effects of air and water quality? These are just a few of the many environmental issues involved. Much of the discussion about eReaders versus paper books has taken place with the best of intentions and indeed makes the most of available information. But the fact remains that reliable information at the required scale (both micro and macro) is not available, and probably never will be because of the cost of acquiring that information in light of how quickly it becomes redundant. 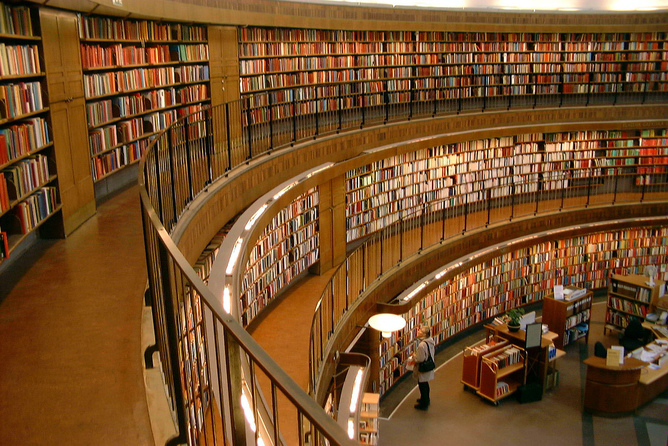 the lowest long term environmental impact remains sharing paper books, buying second hand books and borrowing books from a library (provided you catch public transport there). While a feel good option, this is an unlikely game changer. Borrowing from libraries, sharing books or buying second-hand minimises the environmental footprint left by your reading habits. Inevitably the eReader and paper books (both including newspapers and magazines) have their environmental pluses and minuses. These cover the cradle to grave elements: sourcing and extraction of raw material sources; processing materials and manufacturing products (including byproducts and disposal); distribution and retailing; end user uses (including maintenance and replacement); disposal; and transport at all stages. Each of these elements has within it considerations of sustainability, energy consumption (source of fuel and production of emissions), health and environmental hazards, air and water pollution, and waste disposal. Then there are further individual human behaviour variables such as how the eReader or paper book is used, frequency of use, frequency of replacement (including planned obsolescence) and recycling/solid waste disposal. For example, any environmental benefits arising from using an eReader and not buying paper books are likely to vanish if, like many of us, people give in to the temptation to update their reading device every year or two – long before it stops working. A full Life Cycle Analysis of books versus eReaders might be desirable but is difficult and potentially misleading. These analyses rely on averages or a range of performance inputs and outputs. For the consumer it is difficult to evaluate all the issues let alone compare the different approaches to reading. Both eReaders and paper publications are likely to be part of our reading future. The future will have both eReaders and paper publications. Rather than comparing one with the other for the “best” environmental credentials, it would be better to aim at improving the environmental performance of each. We should require manufacturers to strive for the smallest possible footprint in a sustainable cradle-to-grave operating environment. If manufacturers transparently demonstrate they are meeting this objective, then consumers have the option to prefer their products. Responsible environmental behaviour by consumers is a further critical element in maintaining a sustainable reading environment. Nonetheless, sharing a book appears to be the best way to ensure you minimise the impact of your reading habits. This article was written with the assistance of Dr Bruce Allender, Microscopist & Environmental Specialist at Covey Consulting. When an ambulance passes with its siren blaring, you hear the pitch of the siren change: as it approaches, the siren’s pitch sounds higher than when it is moving away from you. This change is a common physical demonstration of the Doppler effect. The Doppler effect describes the change in the observed frequency of a wave when there is relative motion between the wave source and the observer. It was first proposed in 1842 by Austrian mathematician and physicist Christian Johann Doppler. While observing distant stars, Doppler described how the colour of starlight changed with the movement of the star. To explain why the Doppler effect occurs, we need to start with a few basic features of wave motion. Waves come in a variety of forms: ripples on the surface of a pond, sounds (as with the siren above), light, and earthquake tremors all exhibit periodic wave motion. Two of the common characteristics used to describe all types of wave motion are wavelength and frequency. If you consider the wave to have peaks and troughs, the wavelength is the distance between consecutive peaks and the frequency is the count of the number of peaks that pass a reference point in a given time period. Snapshot of a moving wave showing the wavelength. When we need to think about how waves travel in two- or three-dimensional space we use the term wavefront to describe the linking of all the common points of the wave. So the linking of all of the wave peaks that come from the point where a pebble is dropped in a pond would create a series of circular wavefronts (ripples) when viewed from above. Wavefronts emerging from a central source. Consider a stationary source that’s emitting waves in all directions with a constant frequency. The shape of the wavefronts coming from the source is described by a series of concentric, evenly-spaced “shells”. Any person standing still near the source will encounter each wavefront with the same frequency that it was emitted. 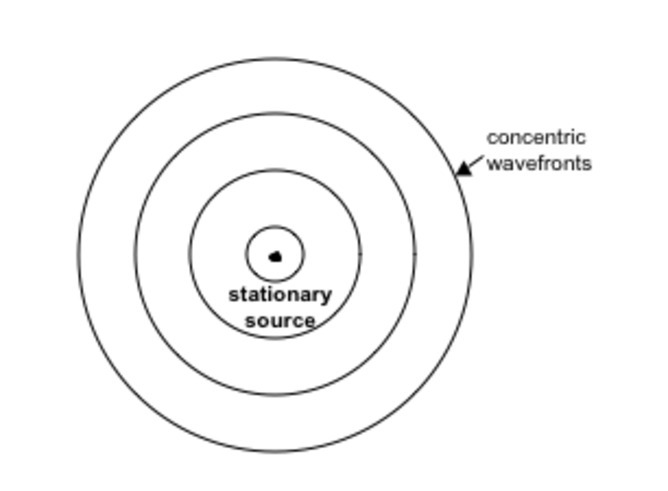 Wavefronts surrounding a stationary source. But if the wave source moves, the pattern of wavefronts will look different. In the time between one wave peak being emitted and the next, the source will have moved so that the shells will no longer be concentric. The wavefronts will bunch up (get closer together) in front of the source as it travels and will be spaced out (further apart) behind it. Now a person standing still in front of the moving source will observe a higher frequency than before as the source travels towards them. 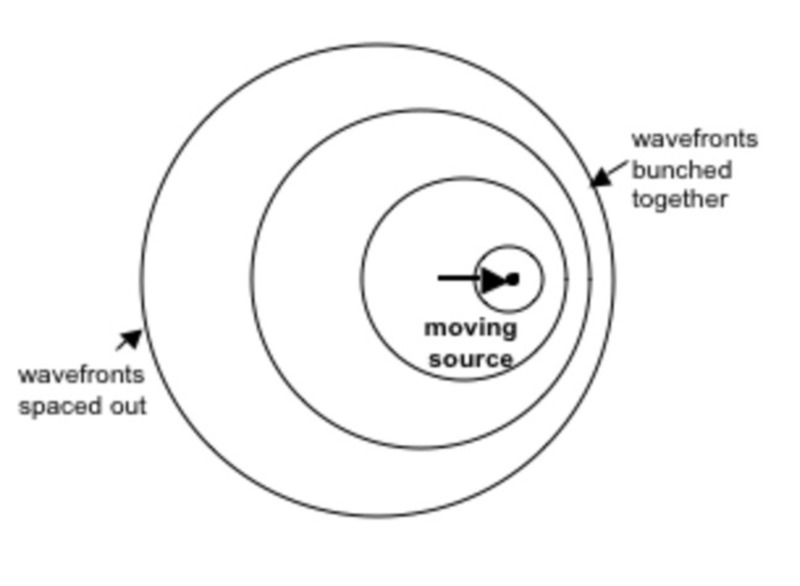 Conversely, someone behind the source will observe a lower frequency of wave peaks as the source travels away from it. Wavefronts surrounding a moving source. This shows how the motion of a source affects the frequency experienced by a stationary observer. A similar change in observed frequency occurs if the source is still and the observer is moving towards or away from it. In fact, any relative motion between the two will cause a Doppler shift/ effect in the frequency observed. So why do we hear a change in pitch for passing sirens? The pitch we hear depends on the frequency of the sound wave. A high frequency corresponds to a high pitch. So while the siren produces waves of constant frequency, as it approaches us the observed frequency increases and our ear hears a higher pitch. After it has passed us and is moving away, the observed frequency and pitch drop. The true pitch of the siren is somewhere between the pitch we hear as it approaches us, and the pitch we hear as it speeds away. For light waves, the frequency determines the colour we see. The highest frequencies of light are at the blue end of the visible spectrum; the lowest frequencies appear at the red end of this spectrum. If stars and galaxies are travelling away from us, the apparent frequency of the light they emit decreases and their colour will move towards the red end of the spectrum. This is known as red-shifting. A star travelling towards us will appear blue-shifted (higher frequency). This phenomenon was what first led Christian Doppler to document his eponymous effect, and ultimately allowed Edwin Hubble in 1929 to propose that the universe was expanding when he observed that all galaxies appeared to be red-shifted (i.e. moving away from us and each other). The Doppler effect has many other interesting applications beyond sound effects and astronomy. A Doppler radar uses reflected microwaves to determine the speed of distant moving objects. It does this by sending out waves with a particular frequency, and then analysing the reflected wave for frequency changes. It is applied in weather observation to characterise cloud movement and weather patterns, and has other applications in aviation and radiology. It’s even used in police speed detectors, which are essentially small Doppler radar units. Medical imaging also makes use of the Doppler effect to monitor blood flow through vessels in the body. Doppler ultrasound uses high frequency sound waves and lets us measure the speed and direction of blood flow to provide information on blood clots, blocked arteries and cardiac function in adults and developing fetuses. Our understanding of the Doppler effect has allowed us to learn more about the universe we are part of, measure the world around us and look inside our own bodies. Future development of this knowledge – including how to reverse the Doppler effect – could lead to technology once only read about in science-fiction novels, such as invisibility cloaks.